The head of the agency investigating the Turkish Airlines plane crash said Thursday that engine trouble may be a factor in the crash that killed 9 people in the Netherlands. Pieter van Vollenhoven said in remarks cited by Dutch state television NOS that the plane had fallen almost directly from the sky, which pointed toward the plane's motors having stalled. He said a reason for that had not yet been established. Spokeswoman Sandra Groenendal of the Dutch Safety Authority confirmed that NOS reported Vollenhoven's remarks accurately. Flight TK1951 from Istanbul crashed about two miles short of the runway at Amsterdam's Schiphol Airport on Wednesday morning, smashing into three pieces and spraying luggage and debris across a farmer's field. It was carrying 134 passengers and crew. Before the crash, the pilots' communication with air traffic controllers gave no indication that anything was wrong. "Turkish 1951 descending from level 7-0," said one of the pilots on the Boeing 737-800 arriving from Istanbul to Amsterdam's Shiphol Airport on Wednesday morning, referring to its altitude of 7,000 feet. "Turkish 1951 hello. Descend to 4-0. Speed is OK for ILS 1-8 right," the controller replied, clearing the airliner to an altitude of 4,000 feet, where it would intercept an electronic beam guiding the plane down to Runway 18 Right. The controller then read out correct radio frequency for communicating with the airport's tower after landing. "OK, thanks sir," the pilot said. Fred Sanders, spokesman for the Dutch Safety Authority, said the flight's data recorders and voice tapes have been sent to Paris, where crash investigation experts will analyze the recordings. He said that study would take several days. Investigators plan to interview crew members, passengers and witnesses on the ground and will explore a number of possible causes, including insufficient fuel, weather-related factors or bird strikes. Sanders said a preliminary result may be made public soon, although the full report will not be ready for months. Despite the catastrophic impact, the wreckage did not burn and a good number of people walked away with only minor injuries. The passengers and crew came from at least nine different countries, including seven Americans and three Britons, mayor Theo Weterings told reporters. Most of the passengers were Dutch and Turkish, but there were also one person each from Germany, Taiwan, Finland, Bulgaria and Italy. 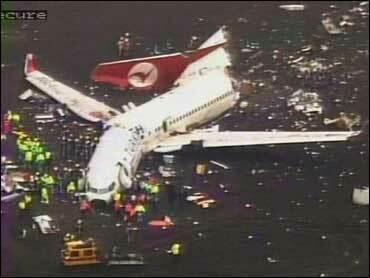 Weterings said the nationalities of 15 of the passengers still had not been confirmed. Four of the Americans were Boeing employees. He said 121 people were treated for injuries in 13 different hospitals and six were still in critical condition. Of the others, an airport official said earlier that 25 were considered seriously hurt. Three of those killed were Turkish pilots, Weterings said. The identities of the remaining six victims and of four critically injured passengers still were not known. It was the deadliest crash in the Netherlands since a vintage DC3 crashed in a shallow sea on Sept. 25, 1996, killing 32 people. The country's worst crash came on Oct. 4, 1992, when an El Al cargo Boeing 747 slammed into an apartment block near Schiphol killing 43 people.